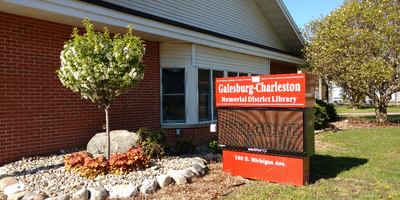 On behalf of the Board of Trustees and Library staff, I welcome you to the Galesburg-Charleston Memorial District Library. We encourage you to browse our website to see what we have to offer. We are pleased to provide a variety of services, materials and programs to our community. Whether you visit us virtually or in person, we want to make your visit a positive one. Our goal is to provide you with excellent service in a friendly, welcoming atmosphere. Feel free to leave us your feedback when you visit the Library or fill out this form. Galesburg-Charleston Memorial District Library is a public library system in Kalamazoo County, Michigan. The Library serves nearly 10,000 residents of the City of Galesburg, Charleston Township and Pavilion Township. GCMDL is a non-profit municipal corporation, supported by millage dollars and private donations. The Galesburg-Charleston Memorial District Library is a member of the Southwest Michigan Library Cooperative.